Grzegorz Ekiert "One hundred years on: legacies of state building, democracy and authoritarianism reconsidered"
Please do not distribute and quote without permission from the author! 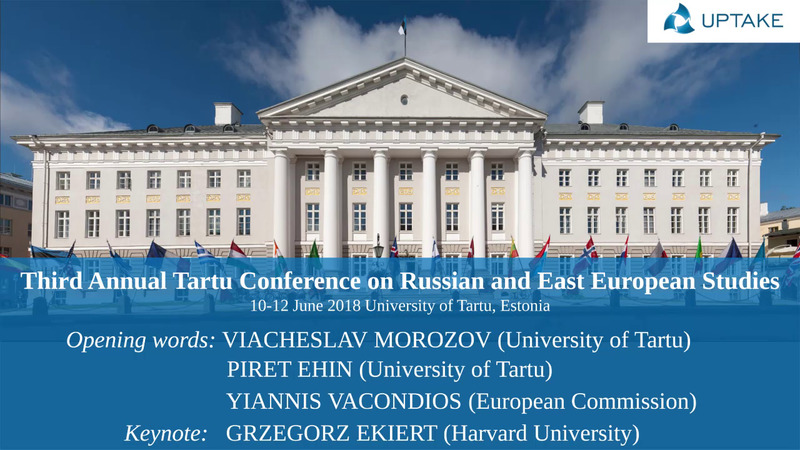 Keynote address by Professor Grzegorz Ekiert (Harvard University) at the Third Annual Tartu Conference on Russian and East European Studies on 10 June 2018. The synopsis: During the first two decades after 1989, countries of East Central Europe experienced a swift and successful democratization process and a relatively painless transition to a market economy. Consolidation of liberal democracy and working market economy opened the door to their accession to the NATO and the European Union. By 2004, it seemed that these countries became “normal” European democracies with respectable economic growth and that any concerns about the stability of their newly established democratic rule could be safely put to rest. Yet, the third decade of post-communism has brought to power nationalist governments that have presided over the striking erosion of democratic commitments and liberal principles. Ignoring concerns of their European partners and protests by the liberal opposition at home, FIDESZ in Hungary and PiS in Poland have begun deliberate assault on the rule of law and fundamental values of the European integration. The increasing shift to authoritarian rule and away from Europe in these two countries is especially puzzling since they were leading reformers under the communist rule, led the region in transition away from communism and were considered the success stories of post-communist transformations. The conference was financially supported by the European Commission under a Horizon 2020 Twinning project entitled “Building Research Excellence in Russian and East European Studies at the Universities of Tartu, Uppsala and Kent" (UPTAKE). It received funding from the European Union’s Horizon 2020 research and innovation programme under grant agreement No 691818. Catriona Kelly "Soviet/Russian Identity, 1881-2018: Empire, Nation, and the Lure of the Local"